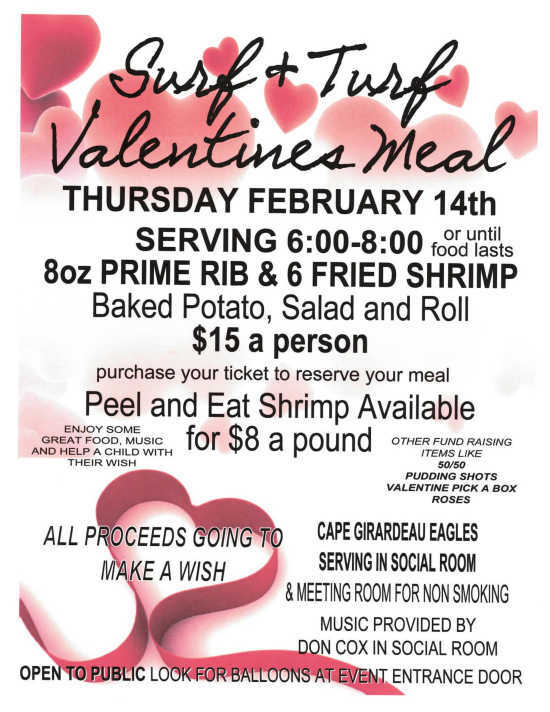 Enjoy some great food & music to help a child with their wish at the Cape Girardeau Eagles Club! $15 per person. Purchase your ticket to reserve your meal. Menu: 8oz. Prime Rib & 6 Fried Shrimp, Baked Potato, Salad & Roll. Peel and Eat Shrimp available for $8 a pound. Other fundraising items like: 50/50, Pudding Shots, Valentine Pick a Box, Roses. Music by: Don Cox in the Social Room. Open to the public. Look for Balloons at Event Entrance Door. All proceeds going to the CHILDREN'S MAKE A WISH FOUNDATION.